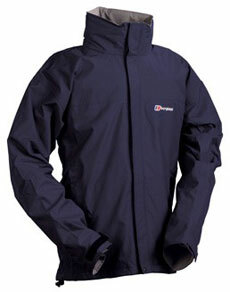 Berghaus says:"Great versatile jacket in Berghaus' own Aquafoil ® waterproof, breathable fabric; provides durable waterproof protection; ideal for year round general use." I've worn the Berghaus RG1 Waterproof Jacket for Men (in combination with the Berghaus Deluge Waterproof Trousers for Men) during walks in the Snowdonia and the Clwydian Hills during the Autumn months. The weather during these trips has been predominantly showery and damp. The fabric is not Gore-Tex but Berghaus' own Aquafoil technology which is great for keeping the rain and weather out - but not so good at letting your own moisture (i.e. sweat) out. The fabric certainly did keep the weather out, even during the heaviest rain, but as soon as I did any work, like climbing the mountain side, the sweat and moisture I produced could not escape effectively and I quickly became damp on the inside. When I stopped for a breather this moisture rapidly cooled leaving me cold and uncomfortable. The overall fit is good (I'm male, 5'11", stocky build - I was wearing an XL) and the jacket includes plenty of room for a variety of mid and base layers. It could do with being a bit longer though. The hood folds away into the collar (which is nice and high giving plenty of protection to the neck) but the hood itself is too small, there is no elasticated hem and the drawcord is cheap and ineffective. There are two side pockets, both of which are large enough to take a folded OS map and both accessible when wearing a belted backpack. Alas, there is no internal dry pocket (for car keys, mobile phone, wallet etc). Not a jacket for walking and hiking in the hills and mountains but if you spend most of your time strolling along canal towpaths or rambling farmland then the Berghaus RG1 Water Proof Jacket for Men might be for you.